Why Dragon Boat racing? Dragon Boat Racing is the ultimate team building challenge and one of the fastest growing water sports in the world. Imagine 20 paddlers trying to move as one, all in a 41 foot dragon boat! It’s a blast. It takes focus, timing, communication and cooperation. Long after the ride is over, the pride and purpose remain to become building blocks for the future. What is a Dragon Boat? The boat is about 41 feet long and holds a team of 22 people, of which twenty are paddlers. You provide a drummer to keep the pace and we provide the steer person to keep you on course. Is any prior experience needed? No experienced necessary. People of all ages and fitness levels can participate in Dragon Boat Racing. It’s a low impact, full body workout that leaves you enthusiastic and energized. If you enjoy working with a team and having fun on the water, Dragon Boat racing is for you. Do we get a practice run? Absolutely. During the Saturday training session, teams will have the opportunity to work together and learn proper paddling techniques. The Race? The race is 300 meters and takes between 2 to 3 minutes to complete by a team working in unison. Each team will have the chance to race three times on Sunday. Loading and staging of the boats takes place in Green’s Park, Lake Orion. The objective is not necessarily to win, but to have fun and create new connections by working together with your team. 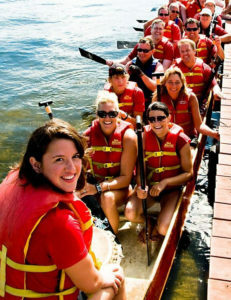 Can I use my Dragon Boat experience as a fundraiser? Yes, many teams raise funds and awareness for their own special cause by collecting pledges and holding team fund drives. Dragon on the Lake also has a division for Cancer Survivors to support the cause. If you have any questions, give us a shout at (248) 693-4986 or email dotllakeorion@gmail.com. To get your team registered, please click HERE.